I finished up my Rainbow Scraps quilt several months ago, and I still love it. It's so colorful. I've seen this quilt several times around blogland, and I love each of those too. You can't go wrong with scraps and rainbows, I suppose. I copied Jolene, and went with black and white for the binding. I almost did grey, but this was just so much better. blue on the back, and all from my stash! Yay! It's my ongoing goal--to try to use up my stash. In my mind I have visions of using up my entire stash, and then being able to add to it. But the reality is, I have got to get sewing if I want that to happen. 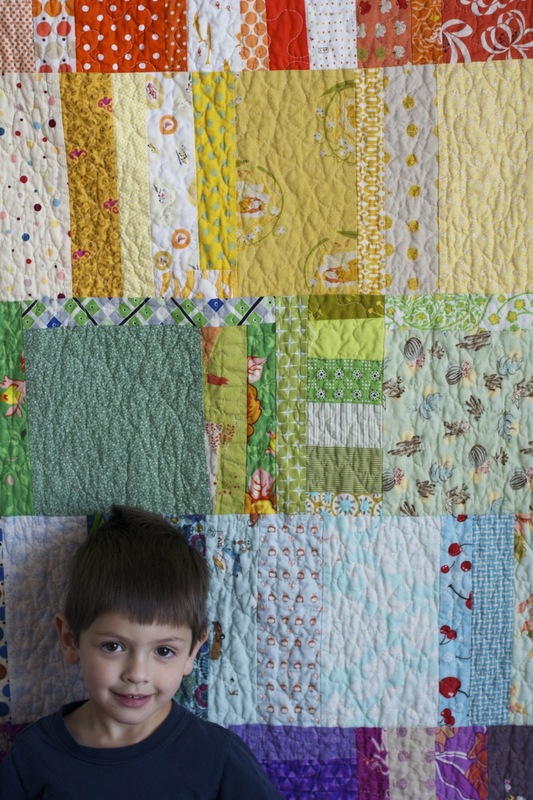 I seriously gasped when the pictures loaded up of this quilt! It is so beautiful! I love every piece of it! it looks awesome, Nettie! i was so excited to see a post from you pop up in my reader. yay! just gorgeous! This is such an amazing, happy, bright quilt. The quilt really looks great! And I understand feeling torn about using up your stash. I want to but then start to panic if I use up too much of any one fabric. So silly! I love it! I'm a sucker for anything rainbow. I love your blog--thanks for the inspiration! Really really nice. I love it. Oooh, I do love a good rainbow quilt, and this one is stunning. I bet you had fun sifting through your scraps and deciding which to use. Such a pretty quilt! You can't go wrong with a rainbow, and yours is a gorgeous example. 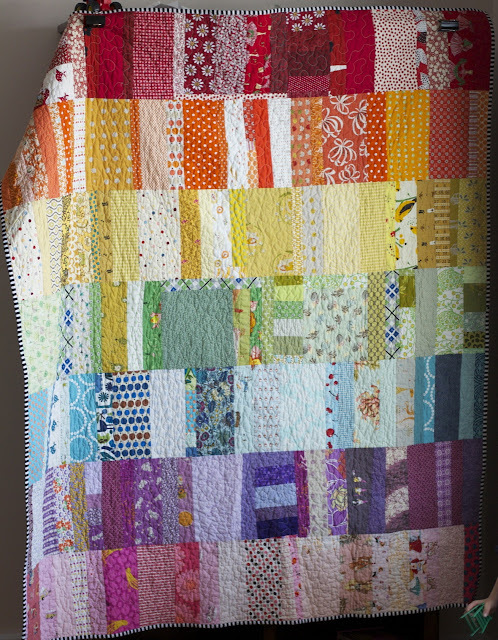 Love your rainbow scrappy quilt...very pretty!!! I dream of having a stash big enough to do this! Great job. Do you know what the flower fabric you used on the back is? But what a stash it is! You have so many beautiful fabrics. Enjoy them =) The siren call of new fabrics is strong, I know. What a wonderful quilt, Nettie! Your quilt is really beautiful! 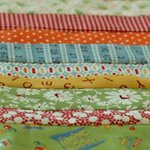 I can totally relate to having time for sewing, especially with summer here... so much else to do! I love your rainbow quilt. 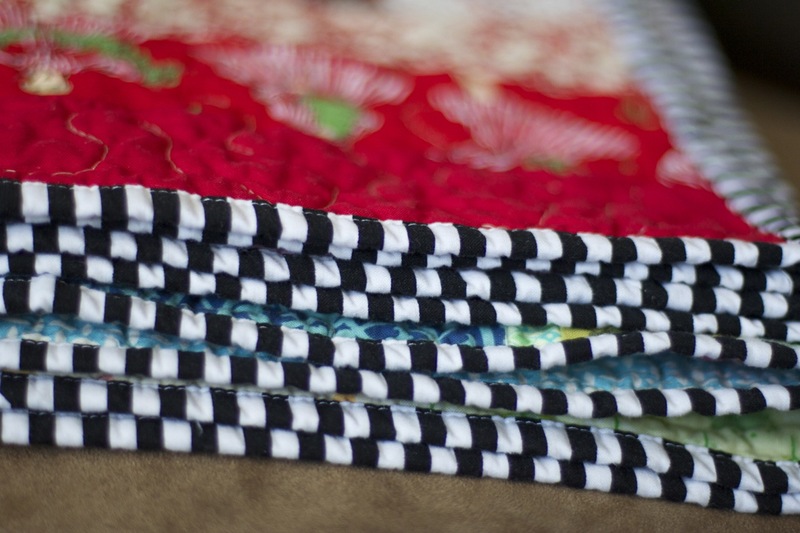 The black and white strip binding sets i off nicely. Good job. Beautiful quilt. 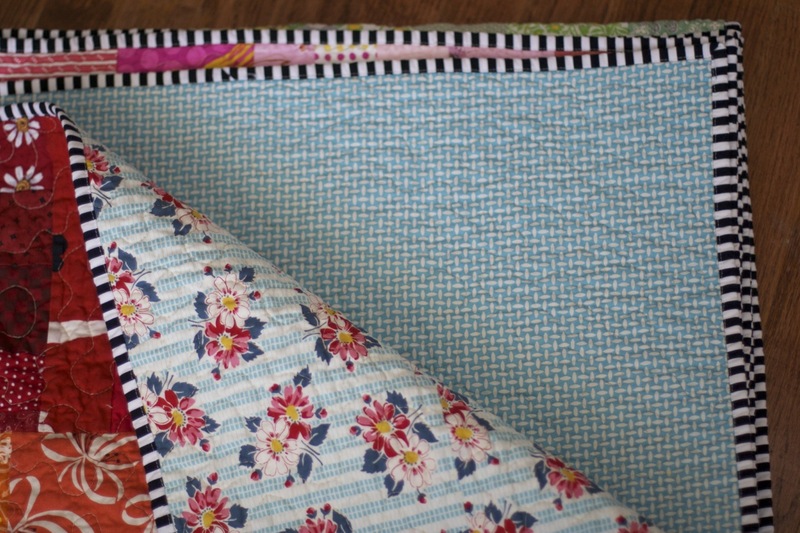 I have two baby quilts to make in the next six months (one for me, eek! ), and I just might do something like this. Congrats on your beautiful baby girl. I hope you're getting some sleep! beautiful quilt, Nettie, you have such an eye for design. I love to watch your family grow. love to all. This looks fantastic! I love the colours! I love the rainbow quilt! And I understand the hard part about getting around to write the blog post! I love it! It's so bright and cheerful!